The state capital is Topeka. The largest city is Wichita. State nickname is Sunflower State. State flower is the Sunflower . State bird is the Western Meadowlark . 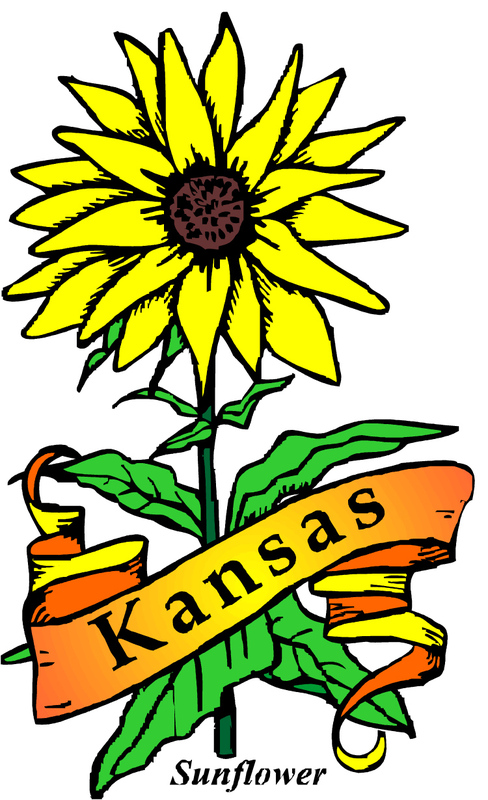 Kansas got its name for the Konza (aka Kaw or Kansa) Native Americans who lived there. Welcome to the site, Constance! I’m glad you’re enjoying the site. We have a great group of Cozy Mystery readers here. Thanks, Sheila, for telling us about Nancy J. Parra. I live in Kansas, grew up on a farm, and really enjoy small town living! Two friends and I are beginning to write a new cozy mystery series that centers around a small Shenandoah Valley town, its library and the eclectic folks who live, love and—murder there! The best to you, Tammy. This sounds like a good new series for all of Cozies. I look forward to reading your book. I have lived in the central Shenandoah Valley most of my life and love to read books set in the Valley. Welcome to the site, Tammy! I hope your book series is a phenomenal success. Danna, Among many of the things that I often wonder about from time to time is if people who live in the many different regions that some of these mysteries are set in ever know of any of the places in these books!! I would imagine that those books that are set in the more common areas such as New York City, Los Angeles, Florida, Texas for example , readers can relate to more. But I wonder about some of the other places that have books set in their area. I know I read a series late last year that was set in Ohio but I couldn’t for the life of me think what town that series could be set in in Ohio. Just an idea that floats in my mind sometimes. Hmmm, Linda C, I never thought about this before. Personally, I prefer reading Cozy Mystery series that are either set in Great Britain or the USA’s East coast. For some reason, I find them Cozy-er. Danna, I know I have said this before but I like to read cozies that are set in areas that I would love to visit. I love to learn about different areas of the country and I do get a lot of knowledge just reading some of these books. I admit a preference to cozies set in the East Coast and GB as well – I think it’s because I love when the setting or plot revolves around an old house (creepy or otherwise). It’s not that there aren’t old houses on the West Coast or in the MidWest…they’re just more prevalent and older in the East (simply because the East was settled first). And of course if English mystery authors are to be believed you can’t move 10 feet without tripping over a quaint little 15th century abode. Julia, I love books that center on old houses near some kind of coastline. There almost always seems to be a storm brewing and the people are trapped in the house with no power. To me, in this type of story the house is the main character. I love it when the house is an old Victorian mansion and while someone is attempting to renovate that house a body or a bag of bones is discovered in the walls. I talked to a man some time last summer who had just bought an old Victorian mansion type house. Along with his wife, he was attempting to renovate. I asked him if he had found a hidden secret places yet! He said he hadn’t yet but he was still working on the house. I told the guy that in a lot of the murder mysteries I read, there seemed to be some sort of secret compartment behind the fireplace or in a closet, and to not be surprised if he found any bodies buried in the walls. He looked at me funny. Linda C, you ought to write mysteries! I just wanted to point out that the quilting mystery series by Sally Goldenbaum (Queen Bees Quilt Mysteries) takes place in a fictional town in Kansas. Thanks, Tara. I have added Sally Goldenbaum (as well as her successor Marnett Falley) to the Kansas list of mystery books. The Baker’s Treat Mysteries by Nancy J. Parra take place in Kansas. I am so happy I found this site. As a small town Kansas librarian, I, as well as many patrons, adore Cozy Mysteries! This site has expanded my knowledge base, which means I can now pass on many new suggestions!!! Cindy, I’m glad that I can help connect you with Cozies featuring your state!